Kathleen Tipper’s diary, kept for Mass-Observation from July 1941 till peace in 1945 and beyond, offers a unique personal insight into one young woman’s war. Kathleen Tipper was just twenty years old in September 1939. 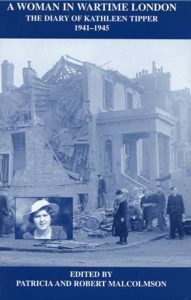 Her parents had met while making munitions in the Woolwich Arsenal during the Great War and Kathleen lived with them and her younger brother and sister at the family’s council house in Appleton Road. Eltham. Grammar-school educated, she worked as a clerk for a shipping company near the Strand. Like so many of the young women around her she was poised to take advantage of the new opportunities for work and leisure that London in the thirties offered as never before. But Kathleen’s life – indeed, the lives of all Londoners – would change for ever in the six years after declaration of war on 3 September. This was a moment of quite extraordinary drama. And Kathleen’s diary, kept for Mass-Observation from July 1941 till peace in 1945 and beyond, offers a unique personal insight into one young woman’s war. We keep her company through the daily comings and goings of family, friends, work and relaxation – all played out against a backdrop of cataclysmic events brought home through cinema, radio and the daily press. We travel on buses and trains and listen to the conversations going on about her. We hear the opinions of ‘blonde glamour girls’, of disgruntled civil servants, of the men and women working the barrage balloons that sway like tipsy bluebottles in the London sky. We witness the effect on her of newsreels and Information Ministry films. We hear her wishing she’d been born a boy so that she could share more fully in the risks and excitements of warfare at the front. We see her disillusionment with people in ‘positions of authority’, especially those there by virtue of class inheritance, and she helps us understand better some of the forces that shaped Labour’s victory in 1945. It is, perhaps, the ordinariness of this extraordinary time in London’s history that comes through most strongly from this fascinating document. Keeping hold of ordinary things was the best way to make sense of a world gone mad. Kathleen Tipper lays bare these fibres of endurance in the greatest crisis to face London and the Londoner in modern times.